How refreshing and ingenious combination! If this is easily available within walking distance from the office, I bet you they will do some SERIOUS business in PJ! Always a pleasure to be back home in Ipoh where this blog was born and thrived for years before reaching out to the thousands of food lovers out there. The imminent move to KL since late 2010 thankfully did not hamper my effort to a detrimental extent; still barely catching up with sporadic write-ups featuring hidden gems from nooks and corners of good old Ipoh. Mydin Mall opened for business in Jelapang not too long ago; a humongous hypermarket that can easily rival the Tesco’s and Giant’s in Ipoh. A second one in Manjoi followed suit within weeks, apparently. AEON Kinta City and AEON Station 18 are both still very much in business and with barely a hiccup in terms of traffic from shoppers, while newer hotels like Tune Hotel, Kinta Riverfront and Seemsoon Hotel opened their doors to travellers within months of each other! And how shall we start this series of food stories? 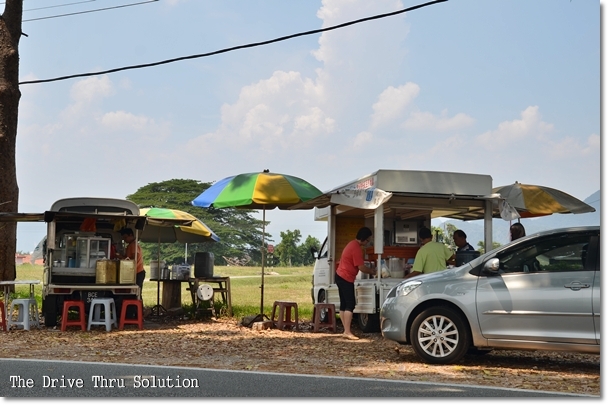 Let’s kick off with a Cendol stall offering drive-thru service! If you (miraculously) remember, there was this Indian uncle selling cendol by the roadside on Jalan Bunga Raya that I wrote about not too long ago. Click HERE to jog that memory of yours. Apparently, that stall and this one directly parked in front of Padang Kilat have legion of fans that are mutually-exclusive. For one, I do not have specific preference. Yet I do concur that this stall operated by two Chinese men in their 50’s serves better Cendol between the two; with a tad more emphasis on hygiene aspects. The difference is not that glaring, since both stalls are located by roadside, easily accessible from the main road of Jalan Bunga Raya and you can literally dump your car anywhere on the curb (just avoid blocking the traffic, please) and have yourself a chilly bowl of the Malaysian dessert. However, the stall here (Pat Che Woon‘s the name emblazoned on the side of the truck) also includes a different type of ingredient that is beyond comprehension if you’re not a Perakian; the “Wan Tau Long” jelly or Yellow Jelly. Essentially, this yellow jelly has a cooling property and tasteless when eaten on its own. Read this post on Tai Wo Yuan for a more thorough rundown on this favourite dessert of mine since I was a child. 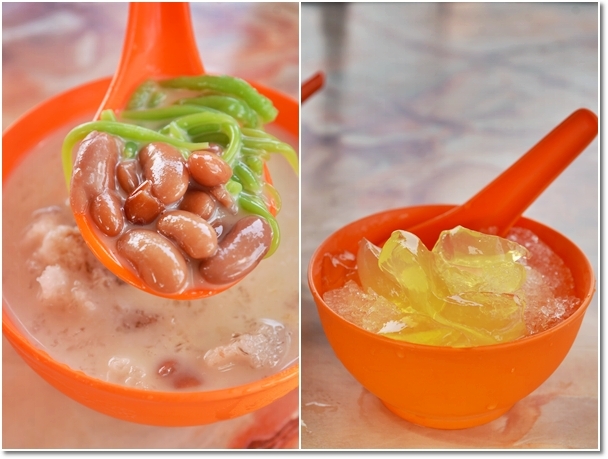 Now the usual Cendol stall would include red beans, sometimes pulut (glutinous rice; conventionally salted) and even sweet corn into the sweet concoction that is made up of shaved ice, ‘santan’ (coconut milk) and ‘gula melaka’ (palm sugar syrup). However, these clever gentlemen offer the mentioned yellow jelly as an option; and I do not see any reason to reject the ensemble at a mere 20 cents more. True, you cannot taste the jelly when mixed into the significantly overwhelming clash of flavours from the santan and gula melaka. But the wobbly and velvety smooth jelly did work its magic by injecting a certain texture to the spoonful of cooling goodness. So much so that … I ended up ordering another bowl of Wan Tau Long (RM1.40/USD0.50) with a mild squeeze of lime just for the sake of alleviating the heat, so to speak. This stall opens in the afternoon only, and does not believe in fixed rest days. “We will rest when we feel like it. But usually … we won’t.” came the reassuring answer. If you’re feeling peckish, go for a serving of Rojak (the quintessential Malaysian salad of fruits and prawn crackers served with a sticky, black sauce made up of shrimp paste, crushed peanuts and at times chopped bird’s eye chillies) from the truck next to this. At RM3/USD1 per portion, the cut fruits were fresh, juicy and went really well with the slightly sweet sauce/dressing with an option for spiciness or without. Their prawn crackers are really good, so it’s best to top up with another piece or two. Location : Refer to the end of the Indian Cendol Padang Kilat post for more details. Basically, this is by the roadside of Jalan Bunga Raya in Pasir Pinji, Ipoh. 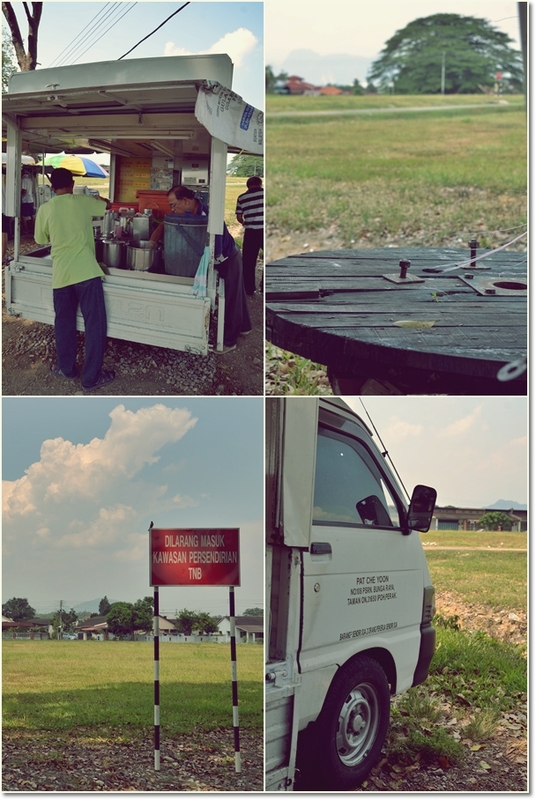 Just after passing by the Indian cendol stall, you will reach the two trucks parked side by side. Come here anytime between 1-4pm for better chances. wow .. it brings back my memories..
i use to go to padang kilat and play those arcade 20cents game.. I never know that there is a cendol there..
Oh apparently, this cendol stall is one of the better ones in Ipoh. 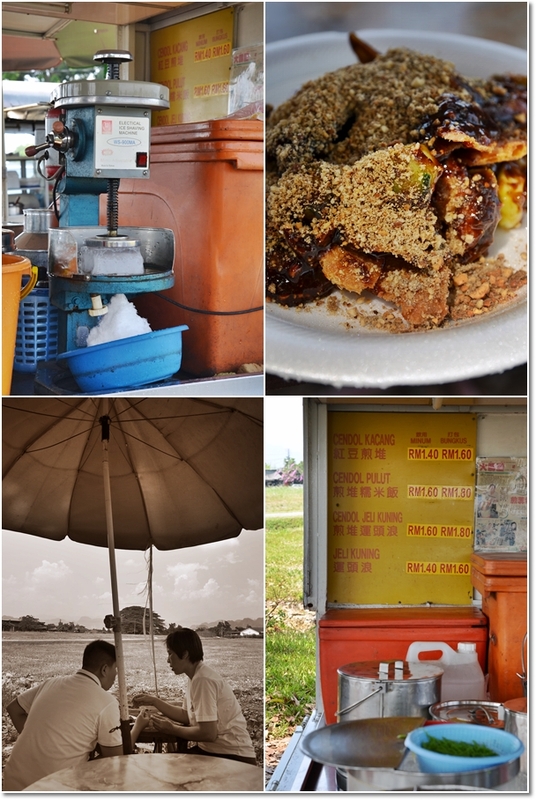 MM, so far the best rojak in Ipoh and KL. The sauce really thick and the portion was big compares those RM5 in KL. 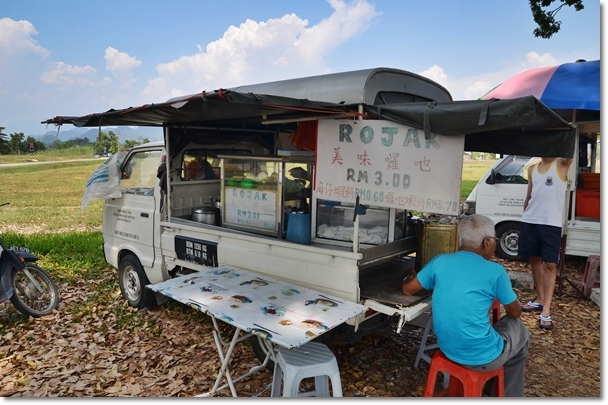 The rojak auntie will have specials only on weekends like fried prawn cracker. After eating my rojak I will cycle to eat “zack lau zhi” or kickapoo. MM, do a review on clay pot rice opposite the twin sister yeong liew (pasir pinji wet market) thanks. Okay, ck. Considered that done. The next round I’m back to Ipoh okay? This time around I had my cravings fixed for certain street foods. I still can’t get into this dessert. Hubby laps up the milk though. You mean cendol? But why? This is God-sent on a scorching afternoon. 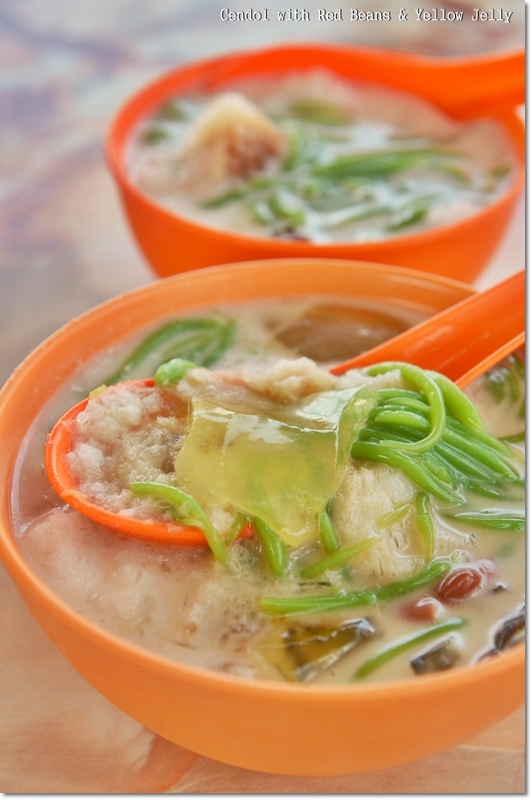 Best cendol in town, according to an older relative who’s lived in Ipoh for 5+ decades.